We open with a CONVOY going heading through mountains, panning back to some generic asian looking military types, he raises his hand and explosive music kicks in, along with the credits. 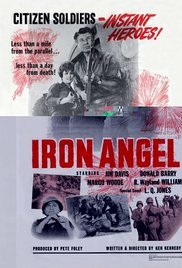 Welcome to Iron Angel and the heroic manly GIs. Sadly not gastro-intestinal. Lots of instructions, warnings of guns, it's sketchy but it's all we've got. Classy. Oh no! conflict between the lieutenant and the sergeant, but 'he'll get that gun, you can bet your life on it'. this could be a long one. And now some random people dancing, with the GI's. they all appear to be losing clothes at a rate of knots. but it is B&W so not that many clothes. The GIs found a first aid truck, the head of the medics is woman! But she's got moxie! Dear god this is bad. having mentioned god, there's a strong undercurrent of god bothering in this movie too. they're having an emotional scene recently the lords prayer while one of them dies. FFS.